A federal district judge in Virginia has become the first to rule that one key provision of the Affordable Care Act is unconstitutional. I haven't read the decision carefully. But it appears that the judge believes that the federal government cannot require that all Americans have health insurance. The government has argued that the constitution grants such authority via the power to tax and the power to regulate interstate commerce--an argument with which I, and quite a few legal experts, happen to agree. The judge, Henry E. Hudson, apparently sees things differently. Hudson's decision was not a slam-dunk for repeal. 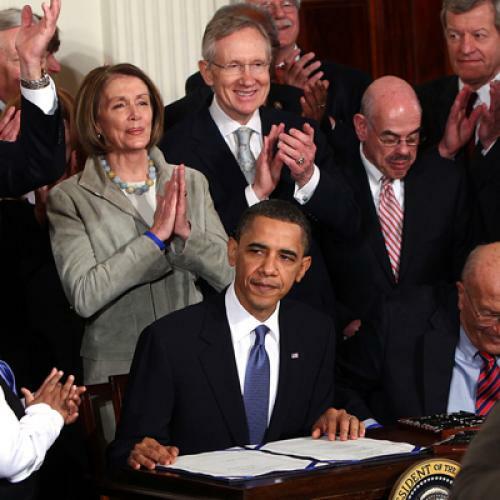 He explicitly rejected arguments that the Affordable Care Act could not stand without the individual mandate. Of course, how well (if at all) the law could actually work without the mandate is a separate question. Hudson's ruling is not unexpected. He is a Republican appointee with a history of conservative rulings. Nor is it definitive. Two other federal district judges, Democratic appointees both, have already ruled that the entire law passes constitutional muster. A fourth decision, by a judge in Florida, is expected by year's end. Most legal experts expect that, eventually, the case will come before the U.S. Supreme Court. Hudson himself acknowledged as much, writing “The final word will undoubtedly reside with a higher court." I tend to think those experts are right, for reasons I'll get around to explaining one of these days. Then again, I recall hearing similar confidence about another highly anticipated court ruling--one about, oh, ten years ago. For more on the mandate and some varied opinions on how an adverse ruling by the Supreme Court might affect the Affordable Care Act overall, see Aaron Caroll, Jonathan Gruber, Ezra Klein, and Igor Volsky. Meantime, if you're looking for a more generic primer on the individual mandate, I highly recommend this video from the Kaiser Family Foundation.